The book is a work of fiction, written by a Pakistani author, about real characters. General Zia Ul Haq, dictator and President of Pakistan, was killed in a plane crash some 20 years ago. This book is then a fictional take on what could have transpired - needless to say the book's plot centers on the assertion that Zia did not die in an accident, but was done in by one of his own men, who could not sit around waiting for the good General to be done in by someone else. Before morning payers on 15 June 1988, General Mohammed Zia ul-Haq's index finger hesitated on verse 21:87 while reading the Quran, and he spent the rest of his short life dreaming about the innards of a whale. The verse also triggered a security alert that confined General Zia to his official residence, the Army house. By way of some historical background, General Zia was the head of the Pakistani Army, who overthrew the democratically elected government headed by Prime Minister Zulfikar Ali Bhutto (who also is the father of Benazir Bhutto) in 1977, and ruled as dictator till his death in 1988. During this time he lent a more than helping hand to the mujahideen effort in Afghanistan to fight against the Soviets, with the help of the Americans and CIA, and their money of course. It's another matter that the mujahideen gave way to the Taliban, who sheltered Al Qaeda, and then you had 9/11 and all sorts of other not-so-nice things that happened to the world. Zia also had other stellar achievements that endeared him no end to India, but these are not germane to this review. On General Zia's left, his former spymaster and the head of Inter Services Intelligence, General Akhtar, seems weighed down by half a dozen medals on his chest and drags his feet as if he is the only man in the group who knows that they shouldn't be boarding this plane. 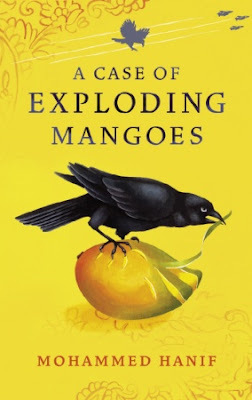 Thrown into the plot are dozens of cases of mangoes, a messenger of a curse in the form of a crow, a blind woman condemned to be stoned to death who is not shy or miserly or less than eloquent with her curses for the one she holds responsible for her plight, Zia's wife who declares herself a widow in front of her husband, Major Kiyani (now the General of the Pakistani army), US Ambassador to Pakistan, an esteemed guest in the construction business who is introduced only by his initials - OBL - surprise surprise, an imprisoned secretary general of the sweeper's union, and what have you. 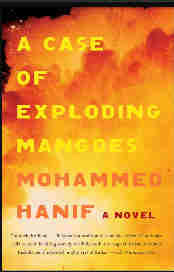 There are two plots that proceed in parallel, one that is in the present and one that is in the past, and in the first tense, narrated by Ali Shigri, a soon-to-be commissioned officer and Air Force pilot, who along with his friend Obaid plot manically to do in the general, to find out what happened to his father, Colonel Shigri, who committed suicide, or at least that's what the autopsy stated, and to avenge his death. As the chapters go on, the two plots converge - to the day that Zia is killed in a plane crash. The 2nd OIC is exhausted from his business with my mother and I can see an appeal to my better sense on its way. I clench my stomach muscles against the impending "cream of the nation" speech. I don't want to throw up. The cell is small and I have no idea how long I am going to be here. "You are the cream of our nation," he says, shaking his head. As Obaid used to say, "God's glory. God's glory. For every monkey there is a houri." Look at the arrangement of fruit salad on my tormentor's chest, above the left pocket of his uniform shirt, and you can read his whole biography. A faded paratrooper's badge is the only thing that he had to leave his barracks to earn. The medals in the first row just came and pinned themselves to his chest. He got them because he was there. The Fortieth Independence Day medal. The Squadron Anniversary medal. Today-I-did-not-jerk-off medal. No sacred cows. Though if you start to wonder about it, cows are not sacred in Pakistan. Because, you see, they eat cows, in addition to other forms of food. No sacred cows - not Pakistan, its army, its generals, the ISI, the mujahideen, Islam, India, heck - even the revered Mangeshkar sisters, Lata and Asha, are not spared. Though the sisters are not given anywhere as harsh a treatment as is reserved for General Zia Ul Haq, the long-since assassinated President and General and dictator of Pakistan. Zia's very un-Islamic lecherousness for un-Islamic ladies, or his piety, or his belief in his piety, or his complete paranoia, which as it turns out was not misplaced, or his belief in the love his countrymen have for him, which however turns out was indeed misplaced, as Zia and his bottom find out one evening. Hanif takes some decidedly wicked pleasure in writing about Zia - whether it is Zia's itch in his posterior caused by eating too many sweets, or his maudlin reactions to his own religious delusions, or his unshakable paranoia that someone is out to get him. All the things that break an ablution had been eliminated from his daily routine - garlic, lentils, women who didn't cover their heads properly. But since he had confined himself to the Army House, this itch had started. All this is fiction, but most readers from the Indian sub-continent would have no trouble identifying Zia with any local or national politician. 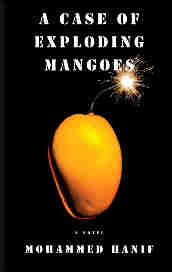 Indian Hardcover Edition from Random House - for reasons I don't quite care to try and understand, the Indian hardcover edition is the only one to actually have General Zia's photo on the cover, and that too so prominently, and none of any mangoes, exploding or otherwise.